Geoff Ind Animation: Goose and Gander Animation loops. Goose and Gander Animation loops. I have been busy this weekend working in Flash, making a couple of new animation loops based on our flock of Geese. The goal of this exercise was to create some new animation using Flash in a more realistic style with texture and colours being as close to the real geese as I could. I started off by taking a few photographs of our geese. I used these images as reference when sketching the geese, mainly focusing on the posing and proportions of the birds. When I had a sketch I was happy with, I saved and imported it into Flash and used it as a template to build my characters. Again I used the photographs as reference for painting the textures and colour of the feathers for both male and female geese. 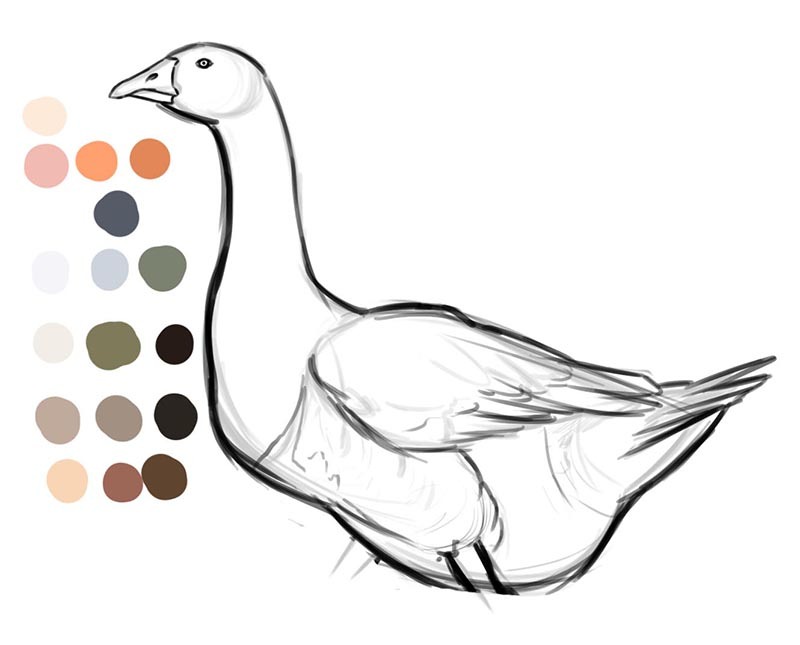 Sketch of a Goose made using photographs as reference. Colour swatches to the left of the sketch where taken from the photographs using the eyedropper tool for ease of colour picking and painting in Flash. The most time consuming part of the process was building the character to start with and getting the colours and texture looking right, after which the animation was reasonably quick to complete. Goose N Gander from Geoff Ind on Vimeo. It has been a fun little project and I'll be having another go with some more animation soon, refining the process further and making more good looking animation!